A1CNow systems provide a fast and easy way of obtaining accurate A1C results (2- to 3-month glucose control average) in the office or home. 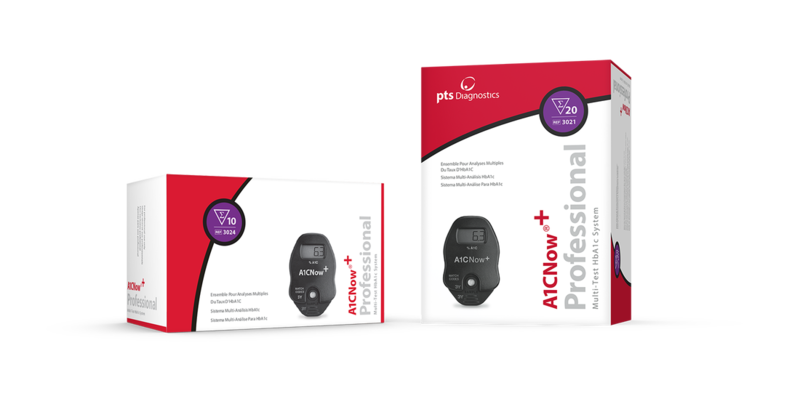 The A1CNow+ professional version offers a choice of a 10-count package or a 20-count package. The home version, A1CNow Self Check, comes in a convenient 2-test pack or 4-test pack with all the items you need to complete all tests. What is HbA1c or A1C? The term HbA1c refers to glycated hemoglobin. It develops when hemoglobin, a protein within red blood cells that carries oxygen throughout your body, joins with glucose in the blood, becoming ‘glycated.’ By measuring glycated hemoglobin (HbA1c), clinicians are able to get an overall picture of what our average blood sugar levels have been over a period of 2 to 3 months. For people with diabetes this is important as the higher the HbA1c, the greater the risk of developing diabetes-related complications. HbA1c is also referred to as hemoglobin A1C or simply A1C. How often should A1C levels be tested? The answer is that people with diabetes should talk to their physician about how often they should test their A1C. People with diabetes may need more frequent A1C tests if the physician changes the diabetes treatment plan or the patient begins taking a new diabetes medication.